يشكل فندق فندق ذا سبينسر أون ذا بايرون بموقعه الممتاز في قلب North Shore نقطة انطلاق ممتازة لاستكشاف أوكلاند. إن موقع الفندق الاستراتيجي، الذي يبعد 6.5 Km فقط عن مركز المدينة، يسمح للنزلاء بالوصول سريعاً وبسهولة إلى العديد من الوجهات المحلية المثيرة. يضفي محيط الفندق اللطيف وقربه من تاكابونا, توف كراتر ريسيرف, نورث شور سنتر سحراً خاصاً على هذا الفندق. كما يقدم فندق ذا سبينسر أون ذا بايرون الكثير من الخدمات لإغناء رحلتك في أوكلاند. يمكن لضيوف الفندق الاستمتاع بالميزات التالية على أرض الفندق: خدمة الغرف على مدار الساعة, مكتب الاستقبال على مدار الساعة, مرافق مخصصة لذوي الاحتياجات الخاصة, تسجيل وصول/خروج سريع, تخزين الأمتعة . تتضمن كل غرف النزلاء وسائل الراحة والتسلية المصممة خصيصاً لضمان الراحة القصوى للضيوف. كما أن مجموعة الخدمات الواسعة الموجودة في الفندق لضمان راحتك تترك لك الكثير من الخيارات لقضاء وقتك أثناء فترة إقامتك. مهما كانت دواعي سفرك فإن فندق ذا سبينسر أون ذا بايرون هو خيار ممتاز لإقامتك في أوكلاند. We recently stayed 1 night here to be close to friends for a function. The location and views were stunning. A special mention to the staff as we turned up early and the Manager allowed us to check in early. After we checked out, we realised we left an item behind and Mathisha went above and beyond to arrange to have it returned to us. Exceptional service. This is one of my favourite hotels in Auckland. So far our stays here have been fantastic, clean,comfortable and spacious rooms with great views from the balcony no matter which side of the building you're on and staff are very nice and easy to deal with. Booked a suite with king bed and was given twin beds. Room stank like curry. Asked to change rooms and was given an identicle room next door. My husband was then taken to 3 more rooms to find a suitable room with the right bed that didnt smell. No minibar. Charged an extra $5 everytime you order roomservice as a delivery fee. Was not worth the 270 I paid for the night. 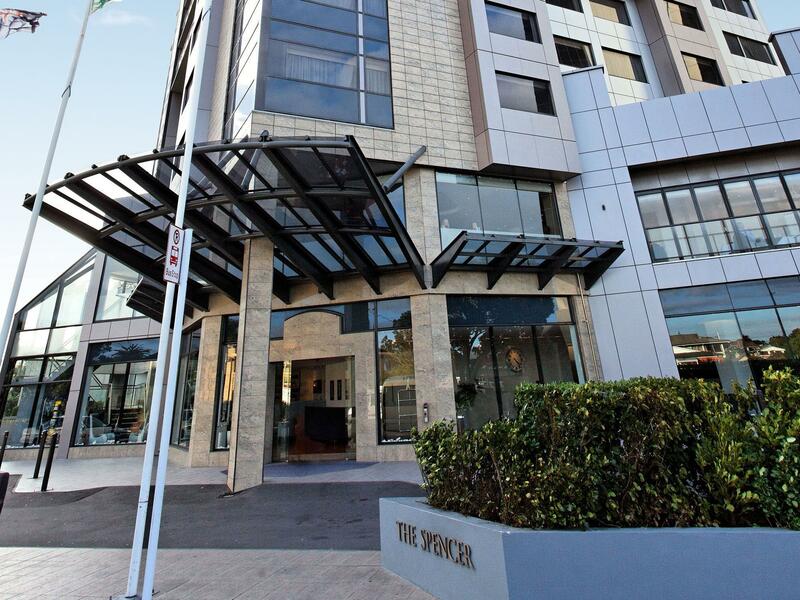 This hotel has been in Takapuna for many years and is always a pleasing hotel. Located in a great area close to cafes, restaurants and the beach, it is an escape from the CBD. The rooms are large, and the view from the higher level rooms is fantastic. Highly recommended. Staff very helpful, was there for a conference with wife, polite and good comunication made staying there really easy. The value for money is great, nice view, good central location, quiet & most importantly the staff on were great thanks team ! We stayed at The Spencer On Byron Hotel for 2 nights. The room is quite big and comfortable. There are kitchenwares which you can cook your own food. Weak point is the internet which advertised in Agoda for free, it is free for 2 hours per day. Stayed for 3 nights excellent room view was awesome looking over the city.staff very helpful,stay before on different occasions will do again when back in auckland. Close to shops, restaurants and the beach. Friendly helpful staff and outstanding views if you book a suite looking towards Auckland. Well worth trying. Unhappy we weren’t aware of the $20 per day hotel carpark fees. For this reason reluctant to stay there again. Great location — short walk to beach. Staff does not give very good advice as mostly just wants you out of the way. There was some ridiculous pageant when there and I had to walk around it, which isn’t a problem except staff acted as if I were stupid when I asked if there was another way to restaurant. Beautiful room. Beautiful facilities. Terrible internet , which made it difficult for me to complete my business while there. I had to keep asking for new codes so I could complete work. Staff was NOT happy about it, but it was not my fault. Just a bit disappointing. The internet didn't work properly, trying to work was very testing and the log in ran out when I had really not used it. Trivial I guess but irritating. Compared to other hotels with the same or similar rates this one is a bit overpriced for what is a pretty basic motel style accommodation. Just probably needs a bit of polish, the staff were lovely but perhaps just need a little training. It was available to book. Very average. Our room key didnt work on first attempt so had to go back to fix that. The room was set up with 2 separate beds even though i had booked a king bed. On the second day the key didnt work again. The internet vouchers were reluctantly provided after they were requested. I would say service provided was average by no means fantastic. Stayed at this hotel as it was the location for an evening function. On arrival, there was a problem getting a "Bell boy" to handle our luggage. My wife recently suffered from a stroke and needed my assistance, so we required a Bell Boy to look after a medium sized suitcase, 2x suit covers and 2x small carry alls.After checking in and arriving at our room, we could not get onto the internet. Reported the problem to reception who informed me that they would issue a new user/password.This was never received.On checking out next morning, called reception twice over a 20 minute period, requesting assistance with the baggage.On receiving my bill of $400.00 for a 1 night stay, I was then asked for an additional $10.00 for overnight parking in the hotel basement car park.